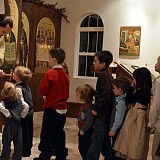 On Saturday, January 14th, members of Christ the Savior joined Fr. John Stavropoulos and St. George's Greek Orthodox Church of Ocean City, MD, for their annual Blessing of the Atlantic Ocean. The festivities were led by His Eminence, Metropolitan Evangelos of the Greek Orthodox Archdiocese. Many thanks to Fr. John and the community of St. George for hosting this wonderful event to the glory of God! On Sunday, January 29th, the parishioners of Christ the Savior gathered together for the Annual Meeting. In addition to reviewing the minutes from last year's meeting, the Parish heard reports from the rector, senior warden, junior warden, treasurer, and auditors. On Sunday, February 26th, with the blessing of our diocesan hierarch, Metropolitan Jonah, the 2012 Parish Council members were installed into office. During the first meeting of the 2012 Council, Kathy Parrish was elected Senior Warden and Bruce Eckerd was elected Treasurer. May the Lord bless them all! 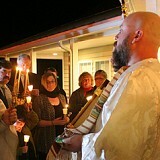 The services of Holy Week, and Pascha were celebrated at Christ the Savior from April 8th through April 15th. Many parishioners, family, and friends gathered for these most solemn liturgical celebrations of the Lord's Passion, Death, and Resurrection. 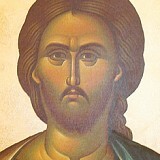 We, at Christ the Savior, greet you all with the joyous exclamation, "Christ is risen! Indeed He is risen!" On Myrrh-bearing Women Sunday, April 29th, an egg hunt was held for the children of the parish. We also bid farewell to Andrei and Lena who are moving to Minnesota and taking their leave from our parish. May the Lord always bless and keep them! On Pentecost Sunday, June 3rd, the faithful of Christ the Savior Mission celebrated their last services in Dagsboro, Delaware. At the conclusion of Liturgy and Vespers, the community packed up the church and moved to the new Parish Center in Berlin, Maryland, where the first Divine Services will be celebrated on the weekend of June 9th and 10th. We warmly welcome you all to join us at our new facilities, which are located at 10315 Carey Road, Berlin, Maryland 21811. On Thursday, February 9th, we received our building permit from Worcester County and immediately began renovations to the new Parish Center. It is hoped that renovations would be complete in the next two months so that the faithful might celebrate Holy Pascha in their new facilities. Check back often as this page will be updated as the work continues! On the weekend of June 9th and 10th, the faithful from the community as well as visitors and friends from afar gathered for the blessing of and first Divine Services in the new chapel. This historic occasion was punctuated with the Baptism of Ana Lucia, whom we wish "Many Blessed Years!" We offer up thanks and glorification to God who has brought this all to pass, and we extend our sincere appreciation to everyone who help to make this happen! 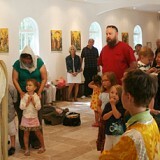 On the weekend of July 7-8, the faithful welcomed His Beatitude, Metropolitan Jonah, together with friends of the Mission from both near and far for the celebratory festivities of "Opening Weekend". Over 100 people gathered on this weekend as we offered thanks to the Lord and those who worked together with Him for the acquisition and beautification of the new Parish Center in Berlin, Maryland. On Sunday, July 22nd, the faithful of Christ the Savior gathered for the Divine Liturgy followed by the annual Blessing of Automobiles. Among the guests visiting the Mission were Rev. 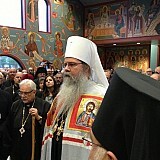 Costa Petrogeorge, who offered an inspired homily, Rev. Barnabas Fravel and Pdn. Gregory Moser, who assisted at the altar table. 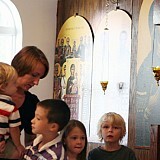 At the conclusion of the Divine Liturgy, eight new icons where blessed for the walls on the new chapel. These icons depict the following events from the life of the Lord. On Monday, August 6th, the Feast of the Transfiguration of the Lord, grapes and various fruits were blessed at the conclusion of the Divine Liturgy. 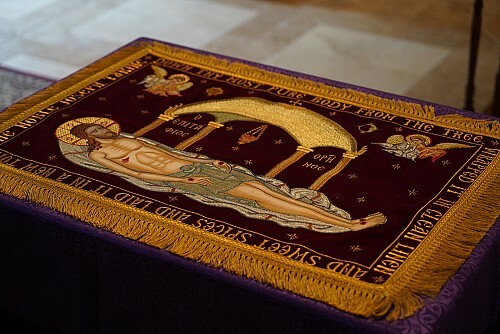 On Thursday, August 16th, the faithful gathered to celebrate the feast of the Icon Not-Made-By-Hands. Following the Divine Liturgy a short molieben of thanksgiving was offered, during which we thanked the Lord for His numerous blessings upon our little Mission. Afterwards there was a pool party / barbeque for all who gathered to celebrate. Glory to God for all things! On September 1st, the Church New Year, the installation of the stone floor in the chapel was completed. We sincerely thank the donors and laborers for the truly beautiful stone work with which our chapel is now adorned. May the Lord’s blessing be upon them and upon you all as we enter the new liturgical year! On Sunday, September 2nd, prayers were offered for teachers and students on the occasion of the new academic year. May God grant His wisdom and understanding to them all! 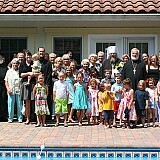 On Sunday, September 9th, the faithful and friends of Christ the Savior gathered for the Divine Liturgy followed by the 2012 Annual Picnic. 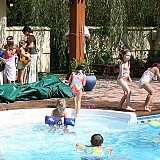 After a raining early morning, the sun came out and a great time was had by all. Many thanks to all who helped make the picnic so great this year! On Sunday, September 16th, Chad and Maria Stewart and their children, were received into the catechumenate, thereby entering into a period of more intense study and preparation for formal reception into the Orthodox Church. We wish them God's continued blessings as we journey together with them to His Heavenly Kingdom! Congratulations are offered to Kaloyan and Iryna Rusanova on the baptism of their son, Kevin. May the Lord grant the newly enlightened Kevin, together with his parents and godparents, Stanislav Angelov Georgiev and Olga Klymuk, many blessed years! On Friday, October 5th, the process of gold leafing the icons in our chapel began. Gold is used to sybolically represent the heavenly radiance which shines forth from the icons of the Savior and the saints. 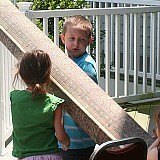 Appreciation is extended to those who donated to continue the work of beautifying the Lord's House. On Sunday, October 7th, Orthodox Christians and faithful residents from Delmarva gathered at St. George Greek Orthodox Church in Ocean City, MD, for a prayer service before the miraculous, myrrh-streaming Iveron Icon from Hawaii. On Friday, October 26th, a new chandelier was installed in our chapel. 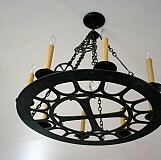 The chandelier was designed and manufactured by New World Byzantine Studios, nwbstudios.com. The design in the disk is adapted from a 6th-century communion patten, and the chain ornaments bear 6-bar crosses. May the Lord bless the donors for their generosity! On Monday, October 30th, Hurricane Sandy made landfall, bringing with it much rain and high winds, causing loss of life and property to many. We, at Christ the Savior, offer sincere sympathy to those affected by this terrible storm, and we offer humble prayer to Almighty God for their consolation in this time of sorrow. We also offer Him gratitude for mitigating the damage which potentially could have been even worse. 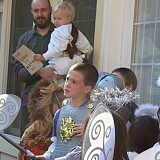 On Sunday, November 11th, the children participated in our annual St. Michael's party, by dressing as saints and angels. Other activities including carving a "Christian pumpkin", bobbing for apples, pin-the-leaf-on-the-tree, pumpkin bowling, donut tree, and various crafts. Many thanks to all who made this year's St. Michael's party such a great success! 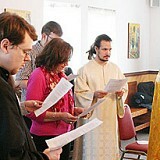 On Sunday, November 11th, prayers were offered at the end of the Divine Liturgy for those in the healing ministries. We ask the Lord's continued blessings upon all those who cooperate with Him in the healing of mankind's physical, emotional, and spiritual wounds and illnesses. May the Lord grant them many blessed years of faithful service to Him and their fellow man! Archbishop Tikhon, Archbishop of Philadelphia and Eastern Pennsylvania, was elected Primate of the Orthodox Church in America during the 17th All-American Council of the Orthodox Church in America at Holy Trinity Church here Tuesday, November 13, 2012. On Sunday, November 18th, Danyella Sandul was received into the catechumenate, thereby entering into a period of more intense study and preparation for formal reception into the Orthodox Church. May the Lord's blessings be upon her as she continues on the straight and narrow path which leads to eternal life! As we celebrate the great feast of the birth of the Lord Jesus Christ, according to the flesh, we greet you with the joyous exclamation, “Christ is born! Glorify Him!”. We humbly ask the Lord’s continued blessings upon you, your family and friends during this festive season and throughout the New Year! On the weekend of December 29-30, we welcomed His Beatitude, Metropolitan Tikhon for his first archpastoral visit to Christ the Savior Mission. Approximately seventy people gathered from near and far for this festive and celebratory weekend. 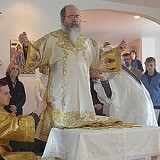 Joining His Beatitude were Archpriest David Straut, Protodeacon Joseph Matusiak, and Subdeacon Roman Ostash.